Last night we were out of ideas of what to have for dinner. Everyone at home was exhausted from work and was too tired to cook. My mom suggested that we would just have some canned goods to top with our rice. I wasn't fond of the idea so I ended up volunteering to cook for dinner and give whatever we have in the kitchen some twist. I found a can of tuna in the kitchen but it will not be enough if it will be served bare for our family since there are four of us. 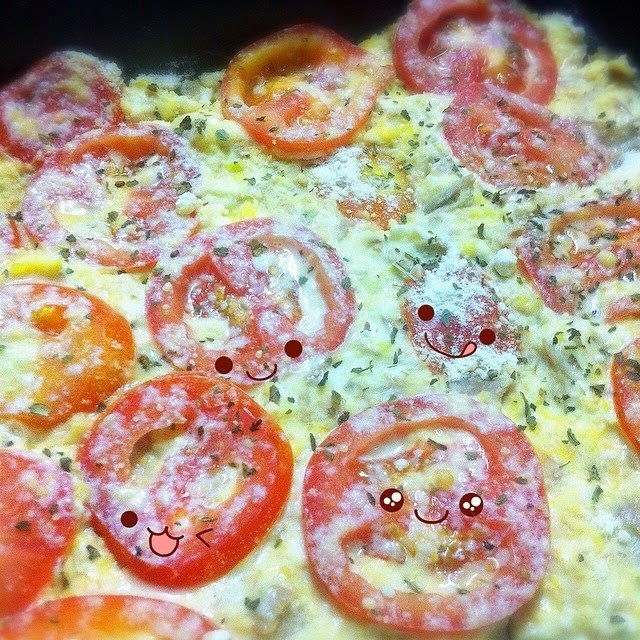 I decided to search for some ideas and photo-inspiration of what to do with tuna on Pinterest and I came up with this experiment (based on what I gathered from the fridge/kitchen): Baked Tuna in Eggs and Cream Cheese, Topped with Tomatoes, Parmesan Cheese, and Basil. Cook in the over at 200 degrees for 3-5 minutes.